Landmark Conservation Deal Offers A First Glimpse Of New Wilderness Once closed to the public, adventure seekers can now explore a wild stretch of New York state's Hudson and Opalescent Rivers. Warm weather has finally arrived in the Northeast. 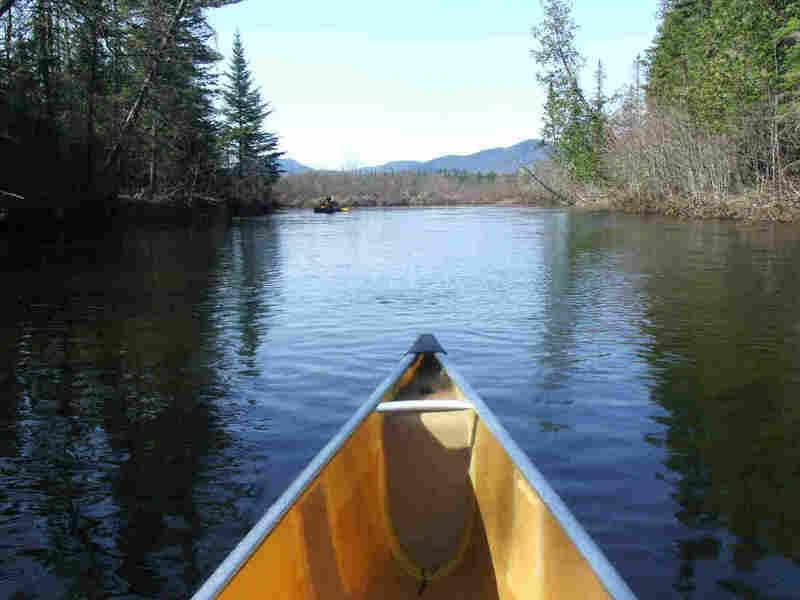 And along a wild stretch of New York state's Hudson River in the Adirondack Mountains, a section has been opened to paddlers for the first time in decades. New landmark conservation deals in New York state have protected vast swaths of wilderness. Those deals have also opened waterways that had been closed to the public for more than a century. I joined Phil Brown on a canoe trip along a wild stretch of the Hudson and Opalescent Rivers. After paddling a couple of hours, we reach a long stretch of golden, sun-struck water. The Hudson River is curtained here by bright green cedars. In the distance rises a sweeping line of mountains still dotted with snow. "We can see the sheer cliffs of Wallface," Brown says. "The terrain here, even though we're surrounded by mountains, this valley we're in is pretty broad, so the river's broad and there's a lot of marshy grasses. It's very placid." Phil and I have been paddling and hiking together for 16 years. He's written some of the definitive guidebooks for the Adirondacks and he's always showing me cool places to go. On this day we're exploring a stretch of the Hudson River just purchased a few weeks ago by New York state. Until now visitors could paddle short sections, but couldn't go ashore, stop to fish or even camp or have a picnic. As our paddling continues, we turn from the Hudson and paddle up one of its tributaries, a winding mountain stream called the Opalescent. What that means is that we're also sort of winding deeper up into the wilderness, birds chirping along the way. The idea that this same wild water will eventually flow down Hudson River to New York City seems impossible. After paddling hard for an hour, we stop on a sandbar to rest our backs and eat lunch. When asked why he makes trips like this, working really hard to reach the middle of nowhere, Phil grins and shrugs. "I just love exploring places like this," Brown says, "I mean, it's beautiful day, it's a beautiful river...and it's just a nice way to spend some time." We set off again and let the current take us home. It sweeps us effortlessly down through thick forests, through marshy bogs busy with spring peepers.